Classic-Castle.com • View topic - Bandit, Bard, Royal Guard, Black Falcon Baron. Bandit, Bard, Royal Guard, Black Falcon Baron. LtoR: Bandit, Bard, Royal Guard, Black Falcon Baron. I had hoped to create an entry for the CCCXI but just haven't had the time. However I had these guys sat on the side since before Christmas, so thought I'd get round to posting them. The 3 torsos on the left are BrickForge stickers. The Baron has a BrickForge sword. Re: Bandit, Bard, Royal Guard, Black Falcon Baron. 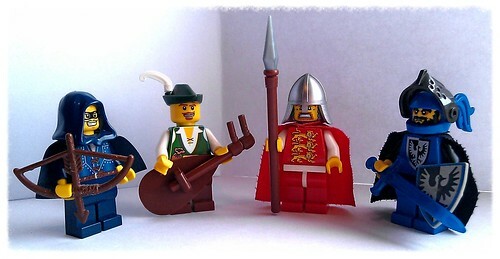 I love the use of minifig hands as tuning pegs on the lute! These are awesome combos! I agree with Karalora, the hands as pegs is great! I love that Black Falcon character, he is just sweet! These are cool, especially the bard. Although the bandit looks almost comical in a good way! Brilliant stuff! I think the bandit looks more like a roguish thief... it's probably because of his dashing good looks. Thanks guys. As mentioned these were all seeds of potential entries into the custom figure/faction categories of CCXI but I ran out of time, inspiration or originality. I think a sticker is needed for the lute and the Black Falcon Baron needs 'bulking up' possibly. I'd agree that the Bandit looks more like a rogue/thief, that head print is so fun. That lute though! I think ill modify that design for my needs! I like that figures. Especially the bard! But the blue Knight is impressive,too.